In this walkthrough, you learn how to create a Silverlight application that includes reusable components in a WCF RIA Services class library. The WCF RIA Services class library enables you to create reusable middle-tier and presentation-tier logic. However, using the RIA Services class library is more complicated than creating a RIA Services solution. 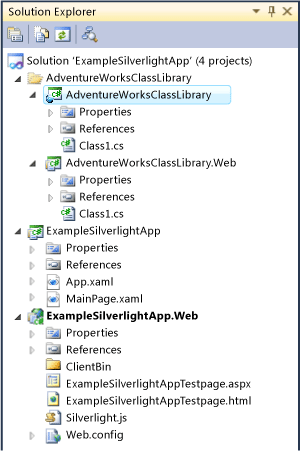 To simplify the example, this walkthrough shows the class library in the same solution as the Silverlight application. The class library can exist in a separate solution. For more some background on RIA Services class libraries, see the relevant sections of the Creating RIA Services Solutions topic. If you do not need to create reusable components or if you want to see a more introductory walkthrough about creating a RIA Services solution, see Walkthrough: Creating a RIA Services Solution. Create a new RIA Services project in Visual Studio 2010 by selecting File, New, and then Project. Select the Silverlight Application template from Silverlight group of the Installed Templates and name the new project ExampleSilverlightApp. In the New Silverlight Application dialog box, do not check the Enable WCF RIA Services box for the application. The Silverlight application does not need a RIA Services link between the Silverlight project and the server project because the RIA Services link will exist between the projects in the class library. In Solution Explorer, right-click the solution, select Add, and then select New Project. 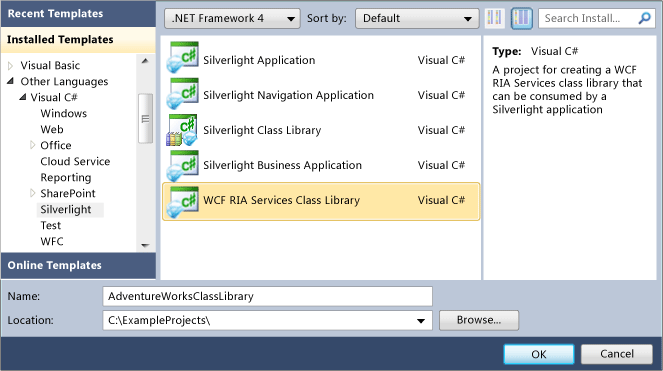 In the Silverlight category Installed Templates, select the WCF RIA Services Class Library template and name it AdventureWorksClassLibrary. Your solution now contains four projects as shown in the following illustration. Right-click the ExampleSilverlightApp.Web project and select Add Reference. The Add Reference dialog box appears. On the Projects tab, select the AdventureWorksClassLibrary.Web project and click OK.
Right-click the ExampleSilverlightApp project and select Add Reference. On the Projects tab, select the AdventureWorksClassLibrary project and click OK. In the AdventureWorksClassLibrary.Web project, add an ADO.NET Entity Data Model named AdventureWorksModel.edmx. For steps on how to do this, see Walkthrough: Creating a RIA Services Solution. In the Entity Data Model wizard, include the Product table in the entity model. Right-click the AdventureWorksClassLibrary.Web project, select Add, and then select New Item. Select the Domain Service Class template and name it ProductsDomainService. Select Product from the available data models to expose through the domain service and click OK. In Solution Explorer, select Show All Files in each project. Notice the Generated_Code folder only exists in the AdventureWorksClassLibrary project. Although no code was generated for the ExampleSilverlightApp project, you can still use the generated code from the AdventureWorksClassLibrary project because a project reference exists between the ExampleSilverlightApp and AdventureWorksClassLibrary projects. Add a reference to the System.ServiceModel.DomainServices.Client assembly. To find the assembly, select the .NET tab. In the ExampleSilverlightApp project, open the MainPage.xaml. Name the DataGridProductsGrid, as shown in the following XAML. Open the code-behind for MainPage.xaml. Add the following code to retrieve the products. Open the App.Config file in the AdventureWorksClassLibrary.Web project, and copy individually the <connectionStrings>, <system.serviceModel>, and <httpModules> elements and the elements they contain. Paste each element individually into the Web.config file of the ExampleSilverlightApp.Web project. The Web.config file will look similar to the following example, but your file must provide the relevant connection information for your environment.